Behind Huijeongdang, the kings quarters, is Daejojeon, the queen's quarters. 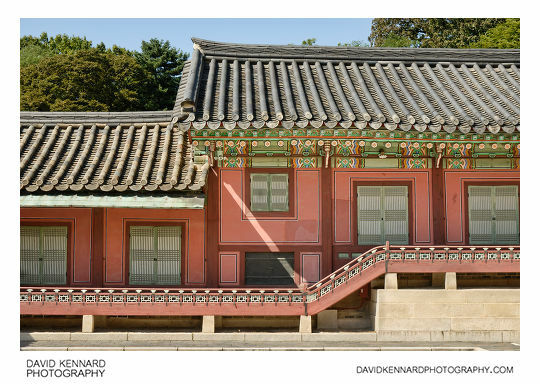 As with Huijeongdang, it was burned down in the fire that struck the palace in 1917 and then rebuilt with materials taken from buildings in Gyeongbokgung palace. The above photo is a seat / couch in Daejojeon. Daejojeon has secondary buildings either side of it, the photo above is of the west building or Seohaenggak (Hangeul: 서행각; Hanja: 西行閣). The sides of both Daejojeon and Huijeongdang (above) have intricate designs with a wooden inlay at the centre. 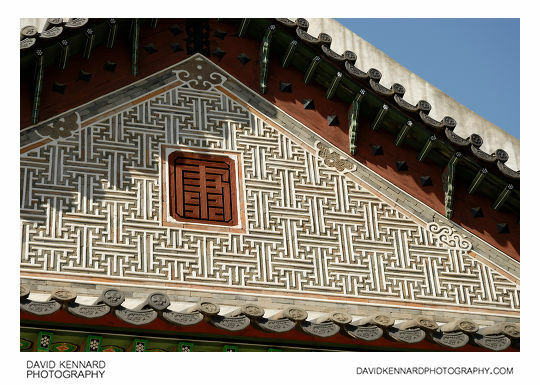 I think the wooden inlay is a chinese character, though I can't tell which one, probably it is quite stylised, which makes it difficult to transcribe. Behind the palace lies the 78-acre (32 ha) Huwon (後苑, Rear garden) which was originally constructed for the use of the royal family and palace women. 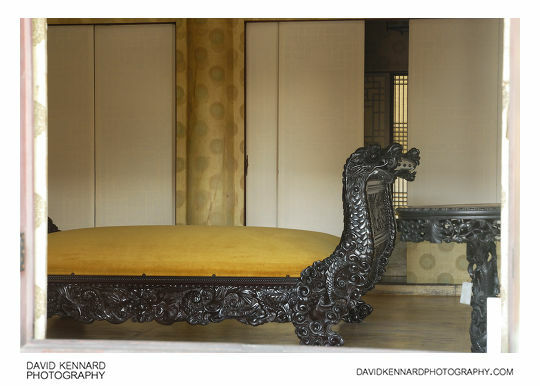 The garden incorporates a lotus pond, pavilions, and landscaped lawns, trees, and flowers. The surroundings and the palace itself are well matched. There are over 26,000 specimens of a hundred different species of trees in the garden and some of the trees behind the palace are now over 300 years old. 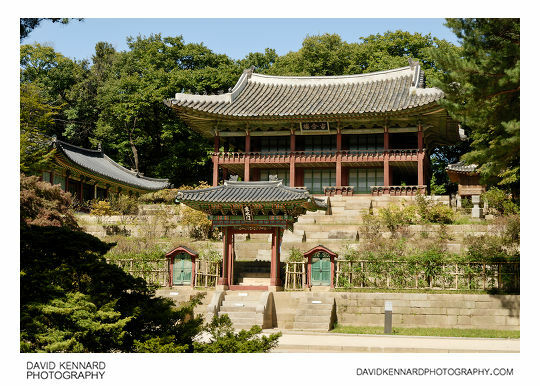 the garden that was extremely private space for the king had been called 'Geumwon'(禁苑, Forbidden garden) because even high officials could not dare to come in without king's permission. 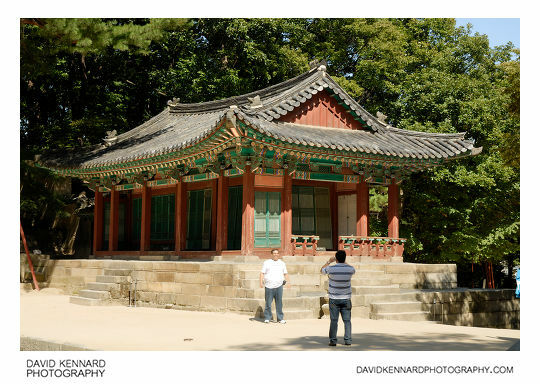 Also it had been called 'Naewon'(內苑, 'Inner garden'). Today Koreans often call it 'Biwon'(秘院, Secret garden) which derived from the office of same name in the late 19C. 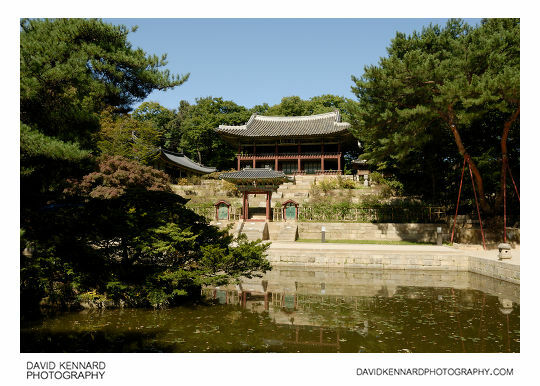 Though the garden had many another names, the name most frequently used through Joseon dynasty period was 'Huwon'. 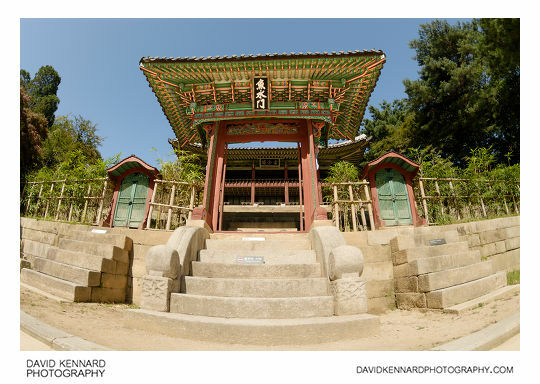 The garden was created at the same time as Changdeokgung, in 1405, and could also be accessed via the adjacent Changgyeonggung palace to the east (together Changdeokgung and Changgyeonggung were collectively known as the 'East Palace'). The garden is adapted to the natural topography, with artificial landscaping kept to a minimum. Throughout the garden are various ponds and pavilions. Many of the pavilions were destroyed during the Japanese Imjin invasion (1592) and were later restored over the reigns of several monarchs starting from 1610. The first area in the garden you come to is Buyongji (Hangeul: 부용지; Hanja: 芙蓉池), which means 'Lotus pond'. On the south-eastern edge of the pond is Buyongjeong (Hangeul: 부용정; Hanja: 芙蓉亭), a small pavilion that was used for private retreats. 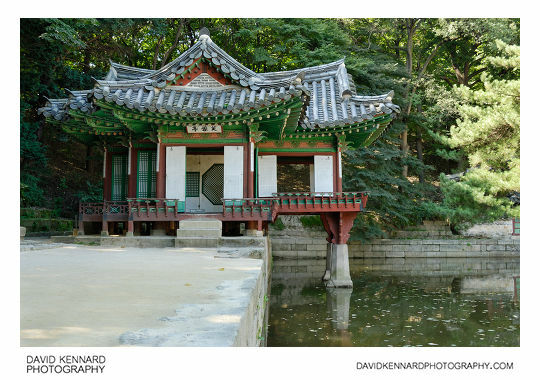 On the opposite site of the pond is Eosumun (Hangeul: 어수문; Hanja: 魚水門), which means 'fish water gate'. The king would use the main gate, and the officials would use the smaller gates on either side. 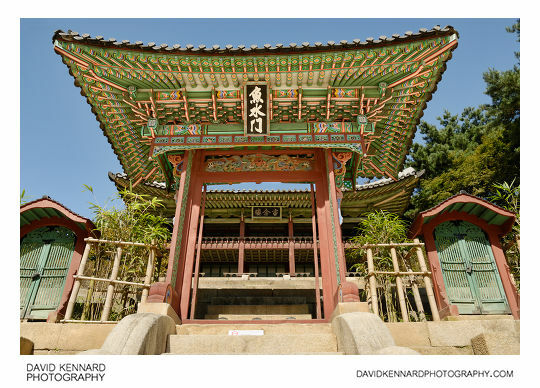 Behind the gate on a raised terrace is Juhamnu (HangeuL: 주합루; Hanja: 宙合樓), a two storey building that housed Gyujanggak (Hangeul: 규장각; Hanja: 奎章閣), the royal library. Looking across the pond you can get a better view of the buildings. To the west of Juhamnu is Seohyanggak (Hangeul: 서향각; Hanja: 書香閣), a building where more books were stored, while to the east is a building called Cheonseokjeong (Hangeul: 천석정; Hanja: 千石亭), or also known as Jewolgwangpunggwan (Hangeul: 제월광풍관 Hanja: 霽月光風觀), a pavilion used for reading and study. During the Japanese occupation of Korea (around 1900-1945) the usage of this area was changed from one of study to one of entertainment. 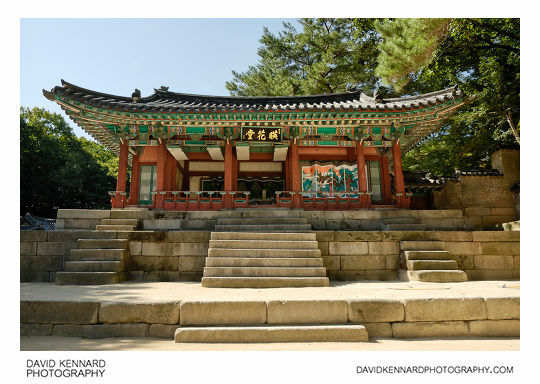 Juhamnu was changed into a venue for banquets, while Seohyanggak was used by the queen for growing silkworms. There also used to be a hedge between Buyongji and the terraced area, but this was removed during this time period. To the east of Buyongji is Yeonghwadang (Hangeul: 영화당; Hanja: 暎花堂). I managed to capture a fellow tourist having his photo taken in front of it. And this is the front of the building. On special occasions state exams would be conducted in front of Yeonghwadang in the presence of the king.